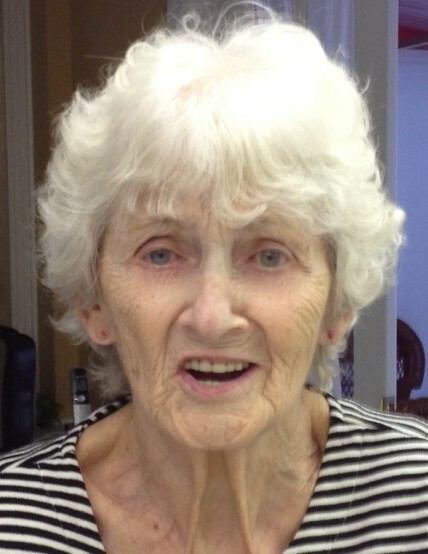 Mary Ellen Blue of Warsaw, Indiana passed away at 2:00 p.m. on Monday, April 8, 2019 at Miller’s Merry Manor of Warsaw at the age of 97. She was born on September 26, 1921 in Syracuse, Indiana to Emma Catherine (Goppert) Ott and Floyd Ott. She was married on November 9, 1940 to Melva Blue, Jr. They shared 71 years of marriage before he passed away on October 14, 2012. Mary was a lifetime resident of Kosciusko County, Indiana and was a graduate of Milford High School. She and her husband Melva, co-owned and operated Service Liquor Store in Warsaw and DeNellie's Pizza in Bourbon, Bremen and Argos for many years. She enjoyed cooking and baking for her family, but most of all she enjoyed spending time with her grandchildren. Mary will be dearly missed by all who knew her. She will be lovingly remembered by her daughter: Paula (Rick) Devenney Young (Warsaw, Indiana); four grandchildren: Tracey (Kerry) Rose (Greenville, South Carolina); Douglas (Rae Ann) Blue (Orange, California); Thomas (Tucker) Holmquist Devenney (Chicago, Illinois); Stacy (Joseph) Stanley (Warsaw, Indiana); six great-grandchildren: Austin & Sydney Rose; Travis & Payton Blue; Makyla (Austin) Devenney Sylvester; and Madyson Stanley; and two great-great grandchildren: Hallelu Adams and Owen Sylvester. She was preceded in death by her parents, husband, son, Dennis Blue, one sister, four brothers, grandson, Mathew Devenney, and her son-in-law James Devenney. Visitation will be held on Thursday, April 11, 2019 from 11:00 – 1:00 p.m. at Redpath-Fruth Funeral Home, 225 Argonne Road, Warsaw, Indiana. Her funeral service will follow at 1:00 p.m. at Redpath-Fruth Funeral Home and officiated by Pastor Larry Burkhart. Burial will follow with a graveside service at Oakwood Cemetery of Warsaw. Memorial donations may be directed to Kosciusko County Community Foundation, Inc., 102 East Market Street, Warsaw, Indiana 46580 to go towards the KC Riley Kids Fund to benefit Riley Children’s Hospital and to help assist area families served by Riley (please make check payable to the Kosciusko County Community Foundation and write the name of the fund in the memo line); or to the Animal Welfare League of Kosciusko County, 3489 E. 100 S., Pierceton, Indiana 46562 and would be appreciated by the family.